TheMacMommy: I Am Crazy Calendar Lady! 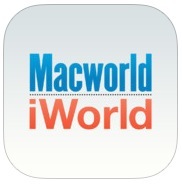 I went to Macworld/iWorld this year! It was a blast! More on that in another post because I'm still digesting it all now that I've pretty much accepted it wasn't all a crazy dream! 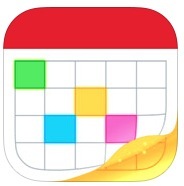 Does having super, color-coded crazy calendars make me any less frenzied? Kinda sorta, but not really because there probably isn't much in the world that can do that. I wouldn't be me unless I wasn't at least a little scatterbrained, BUT having my crazy cool calendars is just lots of fun so I want to tell you about the awesome tools I'm using. YOU might actually find a way to be really super practical with them! First up, I'll tell you about the new kid on the block. It's called UpTo. 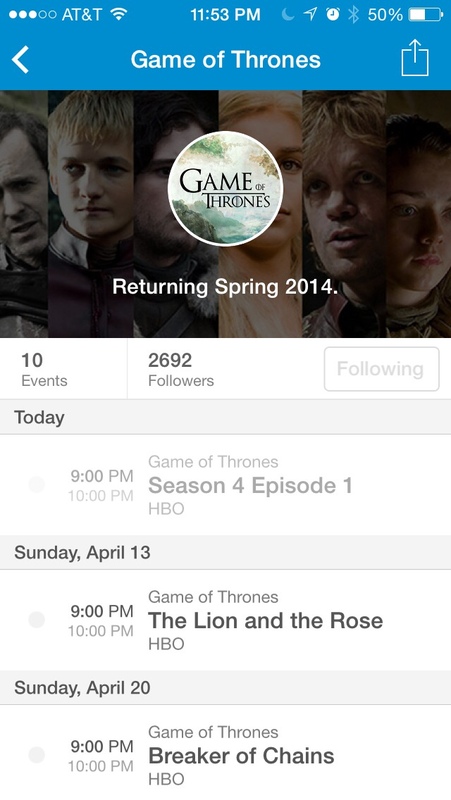 Right now it's only available for iPhone, but they are working on an iPad version. They're also working on making it available in other countries too, but so far as I know, it's USA only. (Sorry global friends. When I know more, you will know more!) This app does what other calendar apps do, but it does it in a really cool way and it has these extra social and entrainment features. Before UpTo, I used to have a hand-made calendar I called "Entertainment" and on it would go information and dates for TV shows I wanted to catch when they became available or so I could watch for them to become available online for free. You see, I'm a cord-cutter since 2009 so when the rest of the world is all excited about TV shows that have just aired, I put my little blinders on and try to avoid the social media spoilers while patiently waiting for them to become available somewhere else that doesn't involve cable TV. I'm a mom, like I can actually watch anything when it airs, come on! UpTo is becoming super handy for this! I really like how it takes a layered approach to calendars. When I use my default iOS calendar, I have to constantly toggle calendars on and off to see what I really need to focus on. UpTo has this really cool pinch to reveal gesture and when you specify which calendars need to be front and center, you can put the less important calendars in the back and then just peek at them when you need to. I mean, the premiere of Game of Thrones is super exciting and all, but it's not going to help me get that cat nap if it's in my face the whole time. 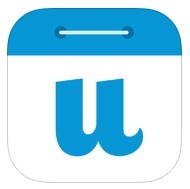 Ok, lets move on to the mainstay of calendar apps. 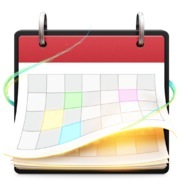 While I'm really enjoying UpTo and using it on the side with all it's cool new social and layering features, it still has its limits and those limits are not present with the darling of all Mac and iOS calendar apps, Fantastical by Flexibits. The developers gave me review codes so I could tell you more about them here. So many of my friends all over the world have been using Fantastical for so long now I had to see what all the fuss was about on the iPhone. I've been using the Mac app for a long time now, so long that it's kind of just ingrained as part of my workflow for entering events onto my Mac calendar which then syncs across all my devices. Yeah, I think they meant for that to happen! I love how the little icon is ever-present in my menubar and it gives me joy to click on it and interact with it from the drop-down menu. If you click this link, you can watch a cool little video to see just what I mean. The interface design of Fantastical 2 for iPhone is super slick, intuitive and easy on the eyes as you can choose from both light and dark themes. 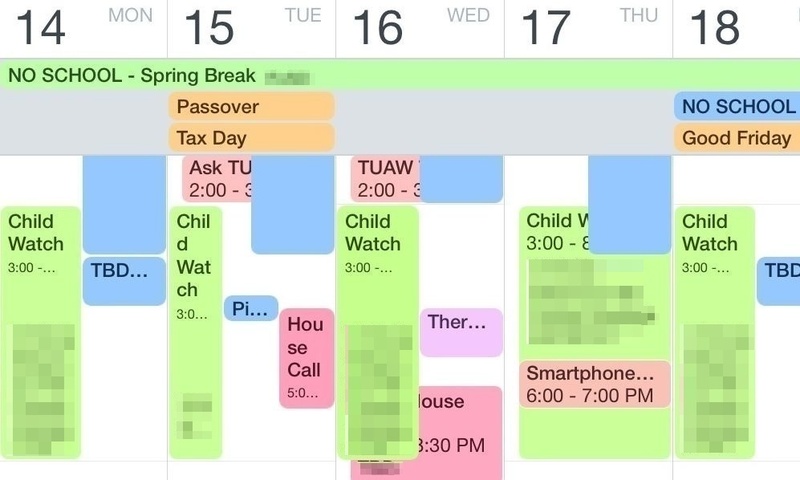 When I was bragging earlier about how my friends think I'm the Crazy Calendar Lady, it's because I was showing them the Fantastical view on my iPhone sideways and watching them all ooh and ahh over all my color-coded blocks! In this example, my Dad has a birthday coming up. 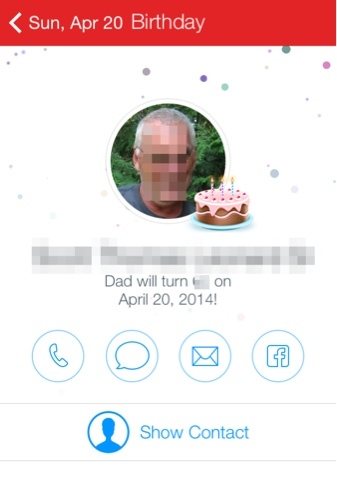 I've blocked out his info for privacy, but you'll notice it says "Dad" and that's because Fantastical 2 respects the nickname from his contact card. Between nicknames and falling confetti, it's these little attention to details that tickles me when I review apps for my blog. As always, you can check out a trial version on the Mac here. Once you fall in love with it as much as I have, you can get it for your iPhone and iPad using these links. Thanks for checking out my reviews and supporting my efforts!